I've got three ducklings, just over a week old and wonder if anyone has tried either Hemcore or Easibed with ducklings this young. I hatched six ducklings earlier in the year, all seemed perfectly healthy and thriving then in less than a couple of hours from seeming fine, they all started dying. It's a bit of a long story but in the end we had a post-mortem done. The vet said he thought it was Reimerella, a bacterial infection but couldn't be sure. As an aside, he said that the duckling was full of wood shavings, which I'd kept them on. He said this wouldn't have caused their deaths but may have contributed. I have these new ones on just paper at the moment with towels on top. I'm a bit worried about using Hemcore as it has Citronella in it, in case the ducklings do eat any of it. Any advice on how to stop them eating their bedding would be much appreciated or any other ideas?? Welcome to the farmingfriends forum. I am sorry to hear about your other ducklings it is always very sad when you lose ducklings or chicks. 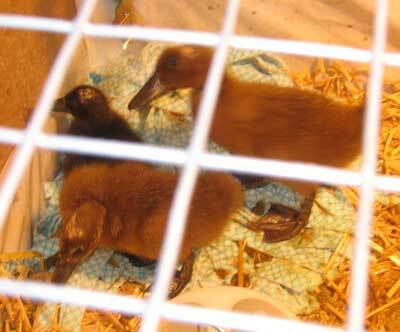 I have successfully kept my ducks when they were ducklings on straw. I gave them chick crumbs to eat and fresh greens and I never saw them eat the straw. The straw will need to be changed regulalry, even daily so that it doesn't get wet and soiled with droppings and then harbour bacteria which could make the ducklings. What a shame about your little ducklings. 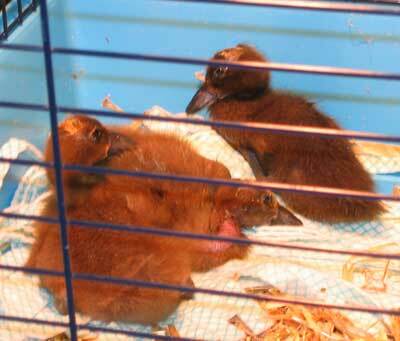 I am raising 5 healthy ducklings on STRAW bedding. They eat chick crumb and now at nearly three weeks, they also have growers pellets - (for ducks and geese) some finely shredded cabbage, grated carrot and occasional chopped apple. They are outside (with their parents) and eat flies and wasps too. Hope the other 3 survive. Thanks so much for your quick replies. I've bought some straw and am just about to put them on to it, been cleaning them out 4 or 5 times a day at the moment so once a day should be a doddle! It was absolutely heartbreaking to lose the other ducklings, especially when they all seemed so healthy and a real mystery as to how they caught a bacterial infection. I was really careful with cleaning all the equipment etc. Someone told me that you should never put poultry in cages that have been used for rabbits and I wondered if anyone else had ever heard of this? 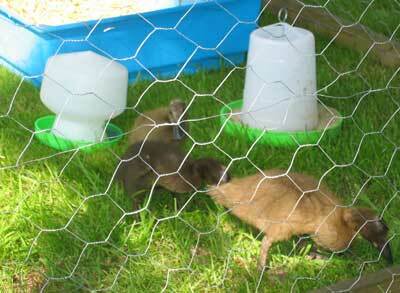 The last ducklings were in an indoor plastic and wire rabbit cage which had been used for a rabbit. I did clean and disinfect it before using it for the ducklings. The latest ducklings are in a cardboard box at the moment and I'd like to transfer them to the cage, which I've now cleaned, disinfected AND sterilised as it's a bigger and better environment for them, they're growing so quickly. They are on antibiotics at the moment as well, the vet advised this as a precaution after last time. I'm a bit neurotic about it all as it was so distressing to lose the last ones. Any more advice gratefully received! Sara runs a great site here at farming friends and along with a few others who also keep ducks, we chat and share good tips and advice. It sounds like you are doing all the right things now so be hopeful. I would also suggest not to go overboard with the disinfectant. Perhaps mine have immunity as they were raised by their parents but i have never used disinfectant, just warm soapy water. Mine get clean bedding every other day. You can find me on facebook Sarah Lancaster - or we will all pitch in and help on here where we can. It is a great site, so pleased I found it. I have read loads of the posts on all things duck related and it is really useful to hear about other peoples' experiences. I've put the straw down and all seems fine although they have soaked it almost straight away, whenever they drink they just splatter it all around the drinker. I've put the drinker in a little dish to try and catch the worst of it but to no avail! I don't have a Facebook account but will keep checking any posts on here regularly. Sara may be able to help you better, as mine have been taught by the adults but my ducklings all went outside on grass from 1 day old and have also been eating insects since then too. But of course they have been kept warm by their parents who settle down with them for regular naps and provide their warmth and shelter. This of course enables them to spill as much water as they like! As they need to dip their whole bill into water to flucsh through the nostrils. It helps them to get in the water. I believe they should be waterproof by now? Thank you both for your complimentary words about the site. It is great to see it being used. I kept my ducklings in a long run in a barn. I kept the drinker at the door end and changed the straw at this end probably twice a day, although they did have dry straw at the other end of the run. 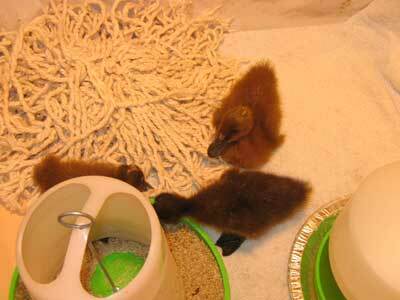 The ducklings drank from a chicken drinker so they didn't get too much water all over the place. Also having a slab or bricks to put the drinker on in the hut can help stop the straw from getting too wet..
You can let ducklings out during the day from 2 to 3 weeks but as I have 5 farm cats and my ducklings would have been free ranging the whole of the farm yard I kept them in the pen until I felt they were big enough to not be threatened by the cats. I gave them grass and lettuce daily as well as feeding them chick crumbs whilst they were ducklings. I'll look out some photos of my ducklings when they were in the run. I look forward to more updates about your ducklings and if you have any photos that you'd like putting on the forum then let me know and I'll send you an email so I can add them. I'd love to send some photos through. I didn't take any for ages with these ones because with the others, we videod every egg hatching and their progress each day. We'd named them all and they were all such little characters that this time, I tried to be a bit more detached from them......but it's really hard, they're so, so sweet. They have been sneezing a bit, which started me panicking as that is what the others did when they first started getting poorly. The vet has advised keeping them on the antibiotics for another week. Have taken lots of pics of them now though. I tried them with some lettuce and grass today and they absolutely loved it, much more interested in it than the chick crumbs! The youngest one was only a week old yesterday so I'll wait until next week to put them out in a run in the garden during the day. Hope this weather cheers up a bit by then. When I first got my ducklings I put them into a large rabbit cage used for indoors, which I too have had my rabbit in during the winter. I had no problems with them inside there, however I did put them in a run during the day (the weather was really good) and then took them back in at night. I started doing this when they were only 2 weeks old and they were fine. Thanks for your comments, it's so good to hear from other people who have raised ducklings successfully. I put mine into the rabbit cage yesterday and so far, they seem fine, loving being able to see out instead of looking at four brown cardboard box sides and a ceiling! Feel much more confident that they'll be OK now. 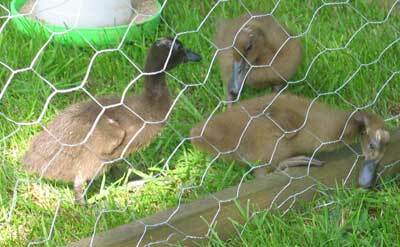 My friend, who lent me the incubator and heat lamp, kept loads of ducklings, they hatched over many years, in a cage previously used for rabbits, with no ill effects. I suppose, because I'm still not really sure why the first lot died, I'm a bit panicky, so when someone told me you should never put poultry in housing that had been used for rabbits, I was really worried about doing it again, in case that was the reason they'd died. Good to know yours were fine. I will put them in a run outside during the day, next week. All three are doing really well so far, touch wood. Thanks for the photos. I have just managed to edit them for the forum. I have copied your email here as well with your update. Thanks for the email. I've attached a few pics of the little ones. They are still sneezing, which is still worrying me but they are eating and drinking fine and still on the antibiotics til the end of this week. Really looking forward to being able to put them out in a run next week for a few hours in the day. Weather has picked up here so I'm sure they'll love the fresh air and sunshine. I like the cage you kept the ducks in. Hope they are still doing well and are off the antibiotics. How are your little ones doing now Christina? I'm sure short spells in the garden will do them the world of good and they will be encouraged to eat the bugs etc that they come across. They are doing fine thank you, they loved being out in the garden over the weekend and I'll put them out again today. They've already caught a couple of flies, they are so FAST! I tried them with some grated courgettes as well as the lettuce and they really like that too. The biggest one is still sneezing a bit but they are growing very fast and he seems really strong and sturdy so I'm feeling a lot more confident that they'll be ok. I did send a few more pictures through to Sara of them out in their run, maybe she will put them on if she has time. Thanks for your interest, I'm sure I'll have lots more questions as time goes on.....! As Christina said above she has sent me some more photos of her wonderful ducklings with this email. Couldn't resist sending these, they LOVED being outside today. As you can see, my husband has almost finished digging out a pond for them and we have a duck house all ready and waiting so, hopefully, they will be able to go outside permanently in the next couple of weeks. I could just watch them all day, they are so cool! 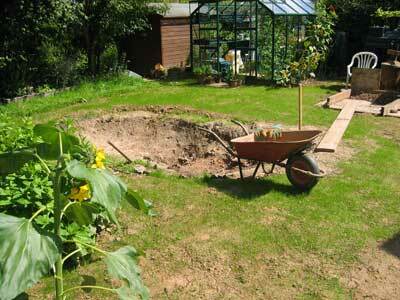 Your garden looks a great palce for the ducklings. 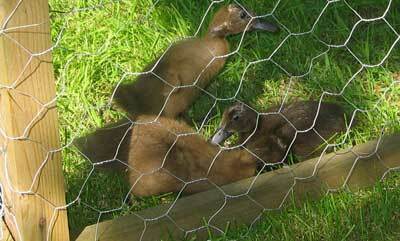 I love the photo of the duckling nibbling the grass,with head out of the wire, so cute. I agree christina, I could watch my ducks all day too!